question_answer1) Anita has some cherries as shown below. How many cherries are there altogether? question_answer2) Count the numbers inside the flowers. question_answer3) 3 more than 10 is represented in which number line? question_answer4) Find the total numbers of pencils of Roman and Rahul? question_answer7) A boy jumps 3 steps from 0 and then again jumps 2 steps. Where will he reach in the following number line? question_answer8) Choose the balloon which gives the correct sum. question_answer9) 1 ten + 8 ones = ______________. question_answer10) Which of the following sign will make the sentence true? question_answer11) Count the total number of bats. question_answer12) How many dots should be drawn to make the total 11.
question_answer13) 4 books are kept on a table. Two of them fell down from the table, now there are 2 books left on the table. This is a problem of _____. question_answer14) Nery has balloons. Out of which 2 are burst. How many balloons are left? question_answer15) I have 3 sweets. Mono gave me 4 more. Lisa gave me 2 more. How many sweets I have altogether? question_answer16) Polly eats 6 biscuits from a packet of 10 biscuits. How many biscuits are left in the packet? question_answer17) Which of the following will give you 12? question_answer18) Pick the add one out? question_answer19) Sonam wants to choose a box whose sum is 16 which of the following box will she choose? question_answer20) Which of the following is true? question_answer22) There are 4 legs in a chair. In a room there are 3 chairs. How many legs does three chairs have altogether? question_answer23) _____ birds are flying in the sky. question_answer24) _____ birds are sitting on the tree. question_answer25) ____ birds are sitting on the water bowl. question_answer26) There are _____ birds in all. question_answer28) ______ girls, playing in the ground. question_answer29) There are _______ children in total. question_answer30) What is the total number of elephants and monkeys together? question_answer31) What is the number of giraffes, lions and birds together. question_answer32) What is the total number of spotted and stripped animals? question_answer33) If = 10 and = 5 then which of the following is correct? question_answer34) Geeta has a book of 89 pages. She has read 56 pages. How many pages are left to read? question_answer35) Solve the riddle I am number '6'. 9 is my best friend. When we both add together we make_______? question_answer36) There are 11 books in a book shelf. Ginni takes out 1 book. How many books are left in the shelf? question_answer37) Which of the following candles will give you the largest sum? question_answer38) Rohan and Mona are playing a game. 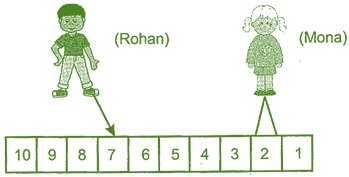 Rohan has started from 7th step. Mona asked Rohan to move 2 steps after 7+h step. Where will he be after moving 2 steps? question_answer39) Rahul and Sheetal have their birthdays on the same day they have two cakes. The candles on cake show their ages. Rahul is turning 9 years old and Sheetal is turning 7 years old. How many total candles they need? question_answer40) Look at the given picture below Which of the following correctly represents the above picture? question_answer41) How many 4's are added to get the number 12? question_answer42) Sarika and her brother Shubham both are studying in the same class 2. Their teacher was teaching about addition in the class but Shubham was not paying attention in the class and disturbing other students too. As a result the teacher scolded her. As a sister, what will you do in that situation? question_answer43) If 3 oranges make 1 glass juice then how many oranges make 3 glasses juices. question_answer44) How many balls should be crossed 'X' to get 7 balls uncrossed? question_answer45) Which of the following is another way of writing 7 less than 12? 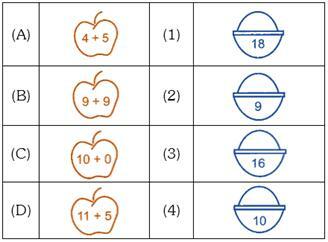 question_answer46) There are 12 mangoes and 6 apples in a basket. What is the difference between the number of mangoes and apples? question_answer48) If means 5 and means 2 find the value of + + + ? question_answer49) Find the number of missing mangoes in the plate 3.
question_answer50) Add me to 6 or subtract me from 14, result will be the same. Who am I?